Watercolor on paper, 25 x 36 cm ( 9.8 by 14.2 in). Signed with monogram. Inscripted with the title above on the reverse. Fine precious frame gold leaf gilded. The artist was master student of the expressionists Campendonk and Nauen. His works are represented in the collections of German museums and galleries including Von der Heydt Museum, Wuppertal and Städtische Kunstsammlungen Hof. He belongs to the so-called "verschollenen Generation" (Forgotten Generation), which describes a generation of young German artists born between 1890 and 1905. Artists who didn't have the possibility of continuous working and neither to exhibit consistently, because their lifes and creation was influenced by the difficult circumstances of two World Wars. Mainly of the Nazi Regime, they became victims of the denunciation of '“Degenerate Art“. Their early work was often destroyed or torn apart and so they fall into oblivion. Until several newer publications and exhibitions, which reminded on their first successes, drawn a wide attention from museums and privat collectors to them. Recently many artists of this generation been revalued and continue to climb in value. They are also called „Expressive Realists“. Further reading: Rainer Zimmermann, Die Kunst der verschollenen Generation (Forgotten Generation), Munich 1994. Note: The watercolor- technique demonstrating the artists skills, because it is one of the most difficult forms of painting, corrections as within oil paintings ain't possible, one false brush stroke and the whole work is destroyed. 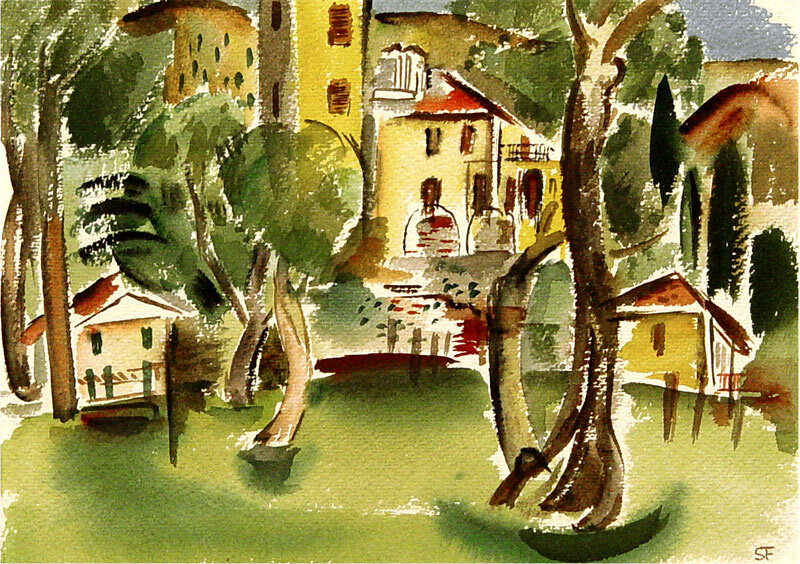 Magnificent watercolor from his first trip to Italy in the 1930s, depicting Gardone a small village at the Lake Garda. The artist deliberately avoids an intensive wet-in-wet technique and sets the delicate colours with very chary and thriftily brushstrokes on the dry paper. He divides the composition into sections and sets those dynamically against each other with the dominating curvated vegetation. 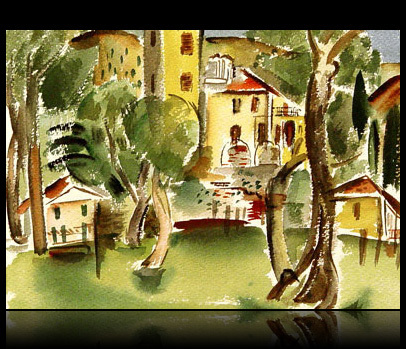 Thus creates the playful lightness of the southern scene, which spontaneity reminds to the excellent watercolor works by Raoul Dufy, and also a expressive verve, which formulation relates to Heinrich Campendonk. Excellent original condition.